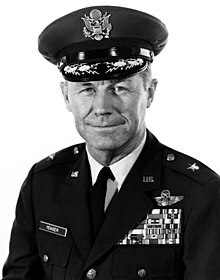 Charles Elwood "Chuck" Yeager (born February 13, 1923) is a former major general of the United States Air Force. He was the first person to break the sound barrier. This was accomplished on 14 October 1947 in a Bell X-1 aircraft. Yeager also served in World War II. ↑ Steelhorst, Mary (May 2003). "Chuck Yeager". Popular Mechanics 180: 72. https://books.google.com/books?id=KtMDAAAAMBAJ&source=gbs_navlinks_s. Retrieved 22 March 2011. This page was last changed on 6 March 2019, at 16:53.